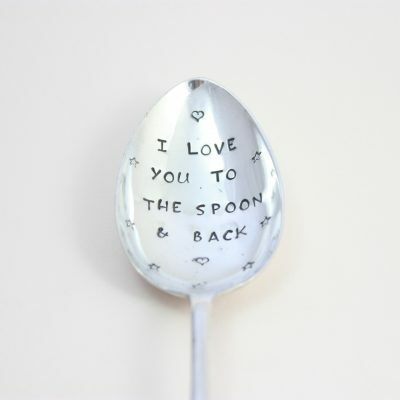 A great fun & unique silver plated personalised spoon, a brilliant gift for so many people! Grandparents, brothers, husbands, kids any body you know who enjoys a bowl of cereal! What a great fun and quirky gift for anybody who enjoys a bowl of cereal! 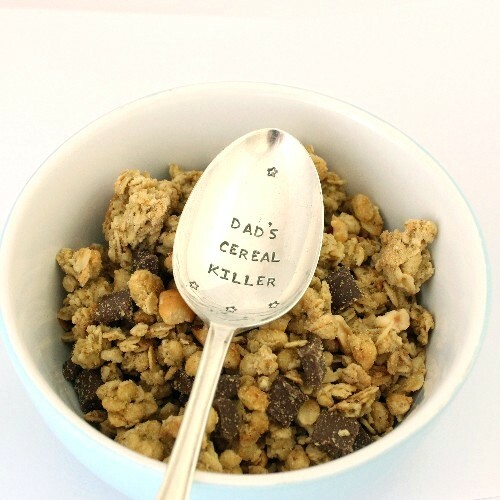 The vintage silver plated cereal spoon has a standard message of ‘Cereal Killer’ and you can personalise with the name of your choice! A personalised silver spoon makes fabulous pressies for uncles, Grandparents, Dads and all too difficult to buy for teenage boys! 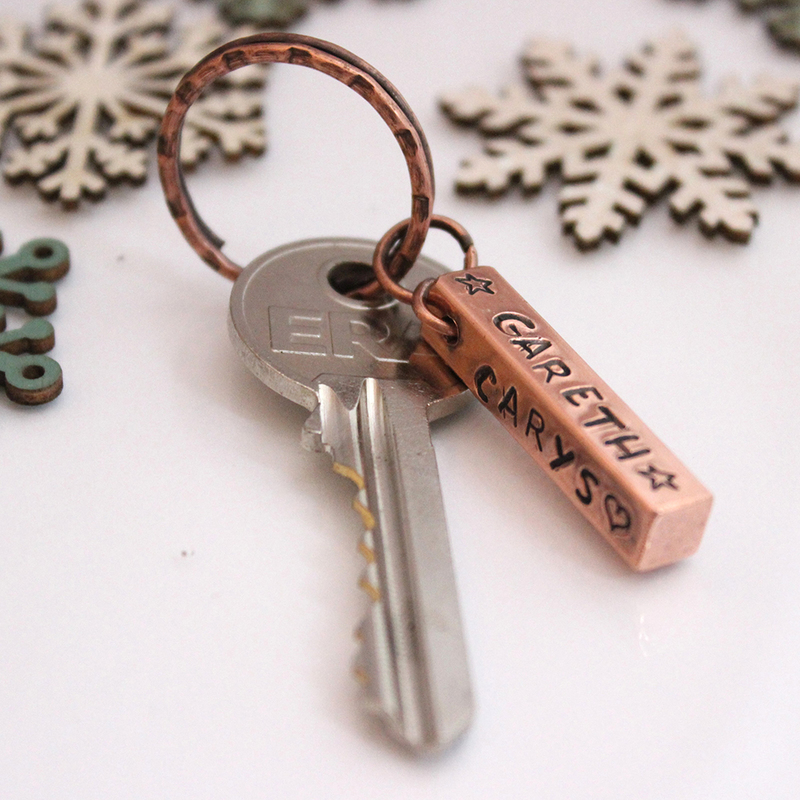 Each personalised cereal spoon carries your message hand stamped in to the bowl of the spoon. Guides on the length of your message are in the ordering section and you can choose to have your spoon decorated with stars, flowers or hearts. Your message will be arranged to best fit the personalised silver spoon and you are able to select either a plain or slightly more ‘fancy’ font. Should any of your wording not fit on to your personalised silver cereal spoon, Impressions to Keep will contact you to arrange an alternative message. 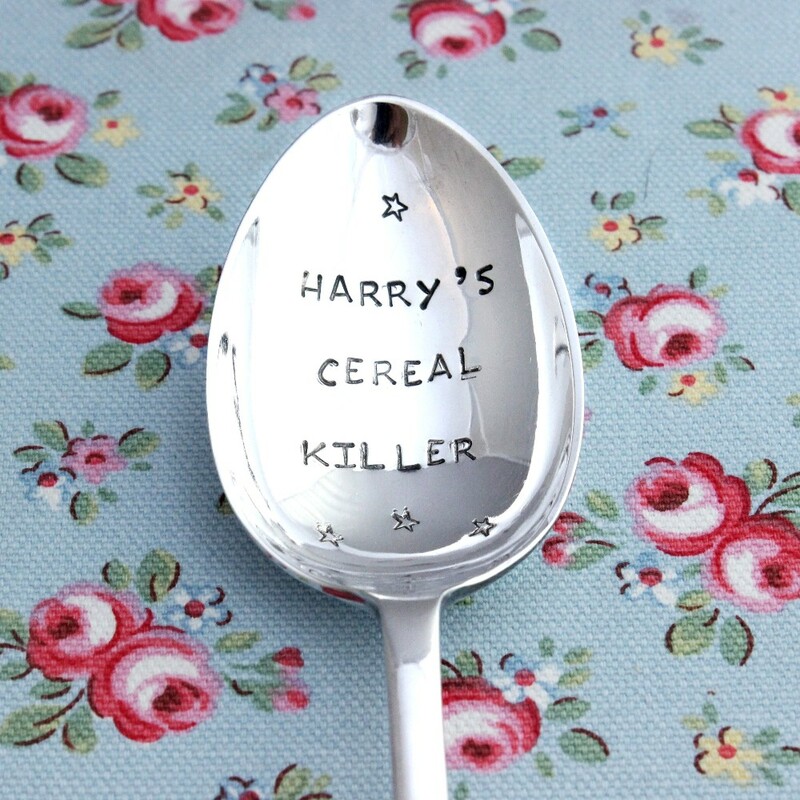 Every personalised cereal spoon is silver plated and vintage and there will be minor imperfections and signs of wear. 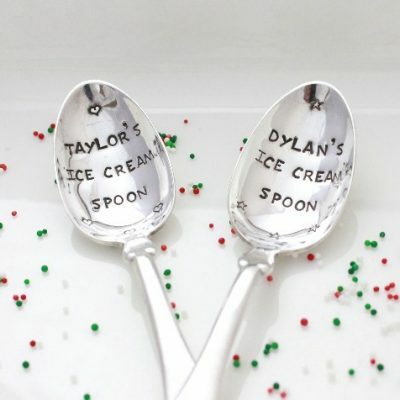 The personalised vintage cereal spoons vary in size from spoon to spoon and will have different handle designs. Every character on your personalised silver plated cereal spoon is stamped individually by hand, using traditional stamping techniques, some small marks are normal in this process and there will be variations in font, spacing and alignment. 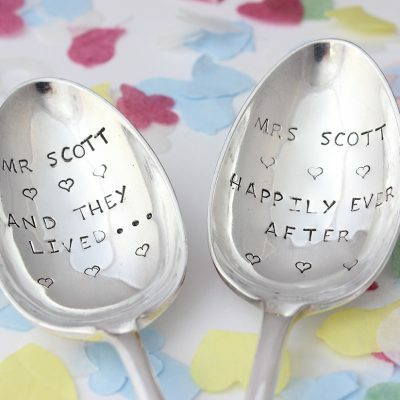 Which all means you are assured of a unique handmade personalised spoon; a bespoke personalised silver plated spoon full of character and charm! 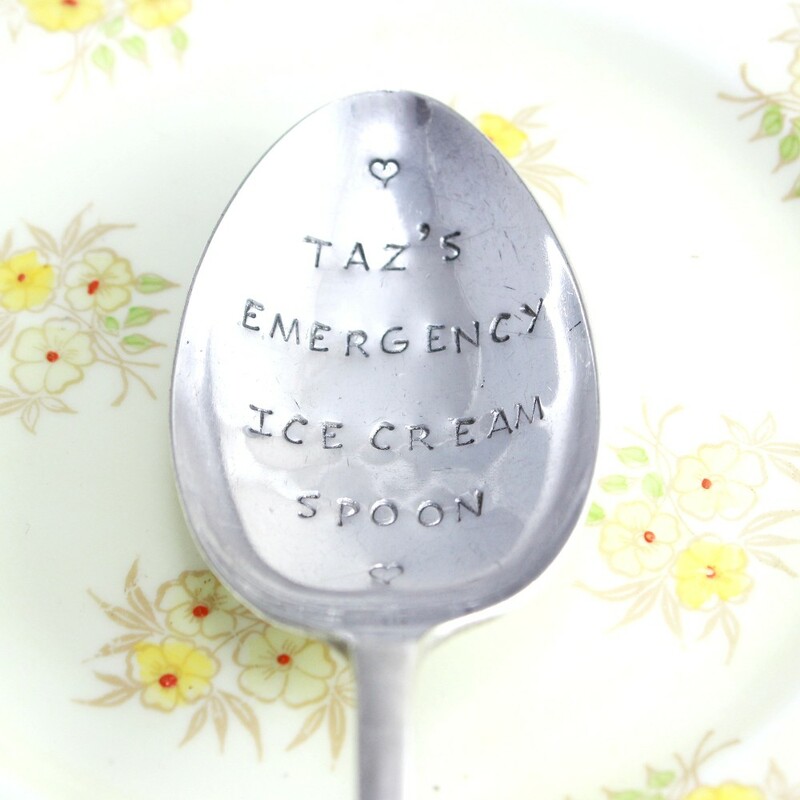 Impressions to Keep delivery times for personalised vintage spoons are approx. 3 weeks from date of order, Please get in touch if your personalised cereal spoon is required ahead of this delivery guide line before you place your order.